Over the two days in May, the hackers worked on real-life challenges to design innovative services and applications using space technologies and data, including three challenges set by the European GNSS Agency (GSA). This year’s competition saw over 3,350 competitors work on 80 challenges in 71 cities across 35 countries. 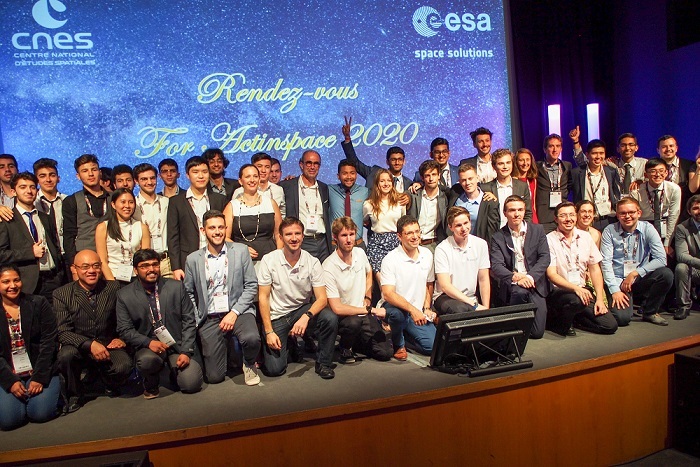 Each city awarded a local winner at the end of the weekend and the international final and awards ceremony was held on 27 June, at the Toulouse Space Show 2018. For this year’s event, the European GNSS Agency (GSA) set three challenges, the first of which – Geocaching by Satellite – asked participants to use Galileo to develop an innovative geocaching game relying on GNSS positioning. For the second GSA challenge – Art with Satellites – teams worked to develop an app to draw and write in a map using satellite navigation and the users’ movements by leveraging on Galileo-enhanced positioning. Finally, the GNSS Satellites Selector challenge asked hackathon participants to design an app to calculate the Position Velocity and Time (PVT) solution by employing their favourite GNSS constellations and, of course, Galileo. By comparing the data obtained by single satellites, they proposed selection algorithms for satellite constellations based on different criteria. In total, 49 ideas were evaluated for the GSA prize by an evaluation team of six GNSS experts from the GSA. After due deliberation, the evaluation team declared Geospinner, a project submitted in the Geocaching by Satellite category, to be the winner. The judges appreciated the enthusiastic presentation of the app by the TensorScience team from Azerbaijan and felt that the idea made great use of Galileo features, particularly its enhanced accuracy. They also felt that the project could be successfully developed in the near future. This year, Act in Space brought together over 3,350 competitors to work on 80 challenges in 71 cities across 35 countries. Jean-Marc Piéplu, EGNOS Services Programme Manager at the GSA, presented the award to the TensorScience team. The winning team will now get the opportunity to present their application at the European Space Week Conference in Marseille on 3-6 December 2018, at the largest gathering of GNSS and Earth Observation experts in Europe. “We were very happy receiving such an award and are looking forward to the conference in Marseille,” team member Nargiz Mammadova said. “We won’t give up on our idea and will continue innovating and making it real. As soon as we do this, Geospinner will hopefully have a great success as it is a completely new version of geocaching that should be interesting for people all over the world,” she said. Thanks to its enhanced accuracy in urban conditions, Galileo plays a pivotal role in the game, by driving users to the caches. Once a cache is found, users find prizes inside, such as spinners, toys or discounts for shops. The caches also contain virtual spinners, which players can either use to buy real goods in local shops or convert into money for charities. Other prizes awarded at the ceremony included the ActInSpace International Grand Prize, a flight in zero gravity in the A310 ZERO-G, which was awarded to the Australian Wright Team Incorporated. This team offered a tamper-proof identification and registration system for UAV operators. The technology used is based on a CNES patent and uses Galileo. The International Audience Award went to the Berlin-based QT-Space team, which proposes to develop a stabilised frequency laser system (Quantum clock). These clocks will play a very important role for future navigation missions and can help provide a more accurate distance. Initiated by the French Space Agency (CNES) and supported by the European GNSS Agency (GSA) and European Space Agency (ESA), ActInSpace aims to demonstrate the socio-economic potential of the space sector and show how it can have a positive impact on our daily lives. By demonstrating that space is a vector of innovation for employment and economic development, the contest hopes to boost start-up creation by encouraging young people to leverage space technologies in their businesses. Participants are called upon to address challenges created by organisers relying on space-related technologies, data, patents and infrastructures. Designed for students but open to everyone, the objective is to foster entrepreneurship, encourage start-up creation and promote the use of space technologies.